The National Aeronautics and Space Administration has been announcing groundbreaking strides in understanding more of space, other planets, and how the earth functions so efficiently. NASA continues to push the field of science further and further to collect more data of the unexplored. Here are some of NASA’s upcoming plans that have recently been announced. The space agency has announced that it has plans of a mission to create and launch a probe to get closer to the sun than ever before. They anticipate the probe to come within 3.9 million miles of the sun, which has never been done before. The mission is set to depart in the summer of 2018. NASA’s Parker Solar Probe is set to handle environments of over 2,000 degrees Fahrenheit paired with extreme solar radiation. The purpose of this mission is to take away data regarding the trace of energy that sources the corona and solar winds. As well, NASA is looking to find more specific information about the magnetic fields and plasma structures from the solar winds. The goal of the probe’s mission is to circle the sun 24 times between the years of 2018 through 2024. NASA has recently released colored artificial clouds on the East Coast of the United States. They released faux blue, green, and red clouds in June of 2017 to test a new system that will aid scientists with studying the auroras of the ionosphere. Essentially, NASA launched a small sub-orbital rocket off of the coast of Virginia that released fist-sized canisters filled with vapor tracers into the atmosphere. These canisters may appear as colorful clouds. The canisters, or tracers, are made of vapors of lithium, barium and tri-methyl aluminum that react with other elements in space, which create the glow. This glow is to visually trace the flow of the particles throughout space. 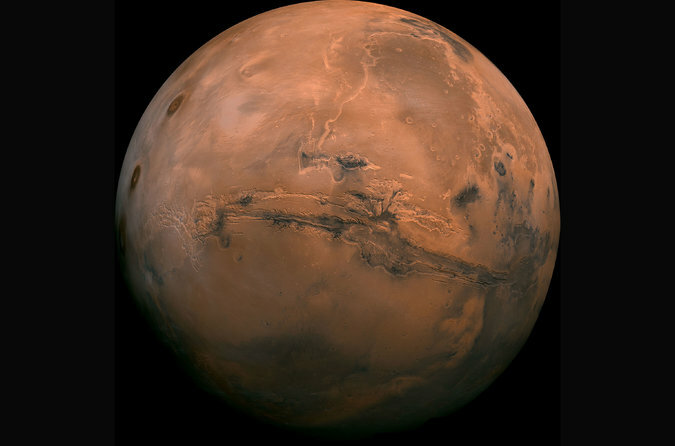 One of earth’s closest neighboring planets, Mars, has shown a new, giant hole on the surface of the planet. This abnormally deep crater is a bit larger than Mars’ normal swiss cheese surface. NASA has yet to find the source of this new pit formed on Mars but there are many reasons for holes to be formed on Mars’ terrain from meteorite impacts to collapsing lava tubes. It’s 2017 and faxing is still very much a thing. As crazy as it sounds, it’s easy to understand why. If you’ve got confidential documents in your email inbox, one wrong click could send them to the bad guys. It’s a key reason many financial, real estate, health-care and legal firms still require you to fax important forms. When my financial adviser insisted I fax a document a few weeks ago, I asked if he could also recommend a good pager. Then I explored my best faxing options, none of which involved getting a fax line, making a toner-cartridge mess or listening to earsplitting digital noises. Rather than use old-school facsimile transmission over phone lines, fax apps and websites send your messages and documents via the internet. After you input your preferred ZIP Code, these services assign you a fax number so you can send and receive faxes via a website, mobile app or even email. They all work similarly: Input your recipient’s fax number and name, write a cover sheet then upload your scanned document. Some even allow you to sign right in the app and fax a document straight back. Among the four I checked out, I liked eFax and HelloFax the best. eFax has web, iOS and Android apps, though it charges a hefty monthly rate starting at $17. HelloFax doesn’t have a mobile app, but it does offer a simpler web interface, five free trial faxes and, for sending faxes, a pay-as-needed option—99 cents for faxes up to 10 pages. (If you go over 10, each additional page will cost 20 cents.) If you want to receive faxes, you’d have to sign up for a plan starting at $10 a month. The next option is to track down an actual fax machine. See if your office has one and ask if you’re allowed to use it. If not, head to your local FedEx Office, Staples or another local shipping store. Staples in NYC was a little better: $1.50 per page, no matter where in the U.S. you’re sending it. In her weekly “You Got This” video series, Joanna offers quick mobile tips meant to be watched right on your phone. Watch more of her “You Got This” videos here. The key to success is often hard to define, but we often try to categorize it as something that we can put a label on, such as hard work, education, or an entrepreneurial spirit. The key to success is most likely different for each one, just like every human is different; the key to each person’s own success will most likely also differ from person to person. Therefore, we should not try to emulate others in hopes of copying their success since that may not lead one down the right path for as an individual. Rather, we should know ourselves better; understand where we come from and what events have shaped our personal brand, strengths and weaknesses. Using this information we can then best determine which incremental key ingredient is necessary for us to maximize our own personal success. Clearly, there are many common factors that will elevate our performance, especially determination. Having a strong determination can go a long way in achieving tremendous success. In fact, most of the fictional characters that inspire us tend to have a strong sense of determination that keeps them going in overcoming hurdles and challenges. However, there is a point where determination may result in diminishing marginal utility and other factors will be necessary in reaching a higher level of success. One of the factors that we sometimes forget in our intense quest of continuously improving may be humility. Humility is commonly seen as the act or posture of lowering oneself in relation to others, or conversely, having a clear perspective and respect for one’s place in context. Humility is often underestimated as a key to success, but it is critical for long lasting success. By being humble, you will never underestimate the competition and the need to learn more and gain new experiences. If hubris is the downfall of greatness then humility should be the trajectory of success. Thus, as we attain incremental success we should always make sure to eat plenty of humble pie to ensure that we stay hungry for more success and never fall into the trap of underestimating our competition. In the Art of War, Sun Tzu wrote: Every battle is won before it is ever fought. We should keep this in mind as we strategies for the next corporate battle and ensure that we remain humble so that we do not overestimate our strengths or overestimate the competition’s weaknesses. Last Thursday ended the application process for those looking to be a part of NASA’s 2017 class. The process started on December 14th and after two months of accepting applications, NASA received 18,300 applicants. This number shattered the 2012 application pool record of 6,300. Unfortunately for the record breaking number of applicants, NASA will only be able to accept 14 or fewer applicants. NASA’s astronaut-selection board will have their work cut out for them over next 18 months, as they will review applications and narrow them down. The best applicants will be interviewed in Houston, at Johnson’s Space Center. After interviews with the cream of the crop, NASA will select a final set of eight to fourteen astronauts to begin training. The training process, according to a NASA official, will include “training on spacecraft systems, spacewalking skills and teamwork, Russian language and other requisite skills.” Those who make it through the intense training process will be receiving different assignments, which include the International Space Station, NASA’s Orion spacecraft, the Boeing CST-100 Starliner or the SpaceX Crew Dragon. These are all incredible opportunities that each person who applied would be honored to apart of. The goal for NASA’s Orion spacecraft is to hopefully launch in the early 2020’s. This specific assignment will be able to sustain a crew of four astronauts for three weeks. Both the Starliner and Crew Dragon are in development aided by NASA’s commercial crew program to bring four astronauts to the space station at a time. Brian Kelly, the director of Flight Operations at Johnson Space Center had a few words to say about this record breaking application number: “it’s heartening to know so many people recognize what a great opportunity this is to be part of NASA’s exciting mission. I look forward to meeting the men and women talented enough to rise to the top of what is always a pool of incredible applicants.” In the end, this will be an exciting but difficult time for NASA as they will be deciding what the future will entail for the NASA space program. Today, marks 30 years since the devastating explosion of the Space Shuttle Challenger that took off from Cape Canaveral in Florida. The shuttle exploded exactly 73 seconds after takeoff, killing all seven on board. It was one of the most tragic accidents in our nation’s history and it marked the first time that a tragedy like this was broadcasted on live television. Millions of people all over the world, tuned in to watch what was supposed to be a remarkable achievement performed by these astronauts turn into horrific nightmare in a matter of seconds. There was also a lot of buzz generated about this launch because of one the crew members on board, Christa McAuliffe. Christa was a teacher and first regular citizen to have the opportunity fly into space. This was a dream of her’s that was cut too short. Once this accident occurred everyone wondered why and how this horrific incident occurred. President Ronald Regan wanted to get to the bottom of it and after forming the Rogers Commission and working with physicist Richard Feynman they found out what really happened on that cold January day. According to Feynman the reason was because the O-ring seal in the right solid rocket booster failed, which let pressurized burning gas escape and breach the external fuel tank, and led to the breakup of the spacecraft. NASA had no way of finding out that the O-ring wouldn’t survive a launch in frigid temperatures. However, there were two engineers, Roger Boisjoly and Bob Ebeling that tried and failed to get NASA to postpone the launch. Ten years after the explosion, CBS had an interview with these two men on the 60 minute broadcast. In a interview, Ebeling said that the night before the launch he tried to stop NASA from launching the Challenger. Both Ebeling and Boisjoly believed that the O-rings could be effected in the cold weather and sadly they were right. After the challenger took off, Bob whispered in Roger’s ear saying “We dodge a bullet” thinking everything would be fine but seconds later everything changed. This will always be a day of remembrance for the innocent people who lost their lives on that tragic day. As of December 15, British astronaut Tim Peake began his stay aboard the International Station. On December 15, he blasted off from Kazakhstan on the Soyuz rocket to begin his six month residence on the International Space Station. According to the British Interplanetary Society, Peake is the seventh UK-born individual to go into space. The first was former chemist Helen Sharman, who participated in the Soviet scientific space mission Juno in 1991. Nonetheless, Peake is making history as the first official UK astronaut. Past British-born astronauts acquired U.S. citizenship, had dual citizenship, or they were space tourists. American astronaut Tim Kopra and Russian astronaut Yuri Malenchenko joined the International Space Station (ISS) alongside Peake. The three men arrived to the space platform six hours after departing from Kazakhstan, and the astronauts occupying the Soyuz space capsule were greeted by the existing resident ISS astronauts. The ISS indicated the launched “beautiful” and there were no reported problems at blast off. However, there had been complications earlier with the automatic docking procedure prior to Peake’s arrival, which resulted in a need for the spacecraft to be steered by the Russian commander in order to dock it. According to BBC’s science editor Paul Rincon, it’s rare for the ISS crew to manually dock the spacecraft because it’s easily regarded as one of the most difficult stages of the journey. However, the skill need to correctly manually dock the spacecraft is exactly Peake and fellow crew were brought aboard, in order to correct a range of other potential failures. It takes approximately four orbits of the earth and six hours to reach the ISS, which will be home to the crew members for the next few months. Already aboard the craft was NASA astronaut Scott Kelly, and Russian cosmonauts Mikhail Kornienko and Sergey Volkov, who are approaching the ninth month of the their one-year ISS mission. Peake, who is a European Space Agency (ESA) astronaut with a background as a test pilot and a British Army Air Corps officer, will conduct scientific experiments while living on the ISS. He will also design educational projects, fashioned to attract young people’s interest in science. Peake has been flying since 1994 after completing the army pilots’ course. He became a qualified flight instructor in 1998 and joined the European Space Agency in 2009 after being selected as an astronaut. He’s spent about six years training to become the first professional British ESA-employed astronaut in space. Peake is temporarily leaving behind his earth-bound wife, Rebecca, who watched the launch from below. Also, his mother, Angela, watched the docking live from a cinema near the launch site. He’s set to return June 5, 2016. Hi from #ISS! What an incredible ride to space yesterday-Soyuz felt so smooth & powerful. Yuri did outstanding job getting us safely docked.